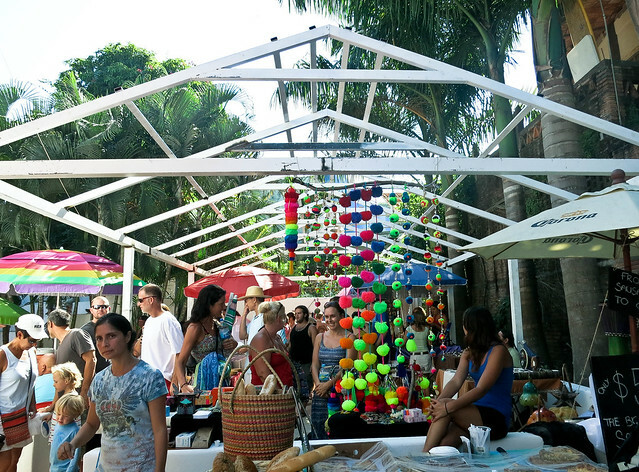 Sayulita’s Mercado del Pueblo – Why Wait to See the World? I picked a great winter to skip. Every time I hear the words polar vortex I congratulate myself for having the great taste to skip out on winter this year (hate me if you want, but know I still didn’t get off scott free). I miss some things, like warm hearty soups, christmas music and cuddling by the fireplace, but then I see the weather report back home and I am patting myself on the back all over again. And we have one of the best parts of summer right at our doorstep: a weekly farmer’s market. Every Friday we visit Sayulita’s Mercado de Pueblo, a locally run market featuring handicrafts, produce and prepared food from all sorts of surrounding businesses and artisans. The stalls run the gamut from home-made dog treats to organic strawberries to fresh falafel. It’s always a treat, the only place in town where we can purchase “non-mexican” treats like hummus, quinoa and freshly ground coffee. We typically have lunch there: hearty italian sausage sandwiches, home-made tamales or mexican fusion egg rolls. On Friday afternoons nearly everyone in town is either manning a booth or browsing the market. Local bands play and collect donations and half a dozen town dogs run amok begging for bits of our sandwich. It embodies the eclectic, hippie dippie, international spirit of Sayulita and never fails to make me happy. The hummus guys! Jalapeno hummus or chipotle? Hard decisions. You better believe I now own a pair of these. The Mercado de Pueblo is open every Friday from 10-2 during the high season. You can follow along on their facebook page for updates. Farmers’ markets are just the best… Especially where epic sandwiches can be found. I loved a good Farmers Market! This one look fabulous. Thanks for sharing! Market photos are my absolute favorite thing lately. Awesome post! Aw – I wish there was a hummus guy in Chiang Mai! I love it! My mom is heading to Puerto Vallarta on Sunday and I’m so jealous. I’d love to travel in her suitcase and take a side trip to Sayulita. Great photos! I’m reading this from the frozen clutches of DC, crying tears of ice. You definitely picked the right winter to move south of the border! Thanks for your insightful posts about Sayulita! We just booked our honeymoon there for christmas and I’m super appreciative to have your posts on file.